Trains have fascinated people since the early 19th century. The first working train to run on rails, a steam locomotive built by Richard Trevithick, made its debut in England on February 21, 1804. The steam locomotive made its way to the United States in August 1829, with the first steam locomotive being imported from England. The Baltimore-Ohio Railroad became the first passenger railroad company in February 1827, officially starting to carry passengers in 1830. We have railroads to thank for standardized time zones. Prior to the regular use of trains for transport, each town ran on its own local time. This made scheduling train arrival and departure times a nightmare. In 1883, railroad representatives began lobbying for standardized time zones. Congress finally passed legislation establishing the Eastern, Central, Mountain, and Pacific time zones in 1918. On May 10, 1869, the Central Pacific and Union Pacific railroads met in Utah. The Transcontinental Railroad connected the East Coast of the United States to the West Coast with over 1,700 miles of tracks. Diesel and electric locomotives began replacing steam locomotives in the 1950's.These trains were more efficient and cost less to run. The last steam locomotive ran on December 6, 1995. Help your children learn more about trains by compiling their own trains coloring book using the following free printables. For more train fun, you may also want to print a set of free train printables. The engine is the part of the train that provides the power. In the early days of locomotives, the engine ran on steam power. This power was generated by wood or coal. Today, most trains use electricity or diesel fuel. Some even use magnets. 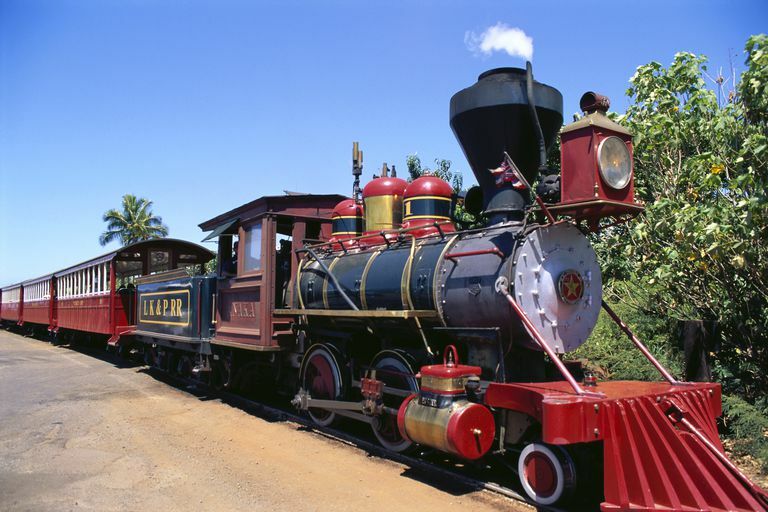 The Rocket is considered the first modern steam locomotive. It was built by father-and-son team, George and Robert Stephenson, in England in 1829. It was built using components that became standard on most steam locomotives during the 19th century. Trains often have to cross valleys and bodies of water. Trestle and suspension bridges are two types of bridges that carry trains over these obstacles. The first railroad bridge across the Mississippi River was the Chicago and Rock Island railroad bridge. The first train traveled across the bridge between Rock Island, Illinois, and Davenport, Iowa on April 22, 1856. People wait for and board trains in train stations. Built in 1830, The Ellicott City train station is oldest surviving passenger railroad station in the United States. Union Station in Indianapolis was built in 1853, becoming the first Union Station in the world. The Flying Scotsman is a passenger train service that has been operating since 1862. It runs between Edinburgh, Scotland and London, England. Cut the pieces of this coloring page apart and have fun assembling the puzzle. For best results, print on card stock. In the early days of trains, before radios or walkie-talkies, people working on and around trains needed a way to communicate with each other. They began using hand signals, lanterns, and flags. A red flag means stop. White flags mean go. A green flag means go slowly (use caution). Lanterns were used to transmit train signals at night when flags couldn't be seen. Swinging a lantern across the tracks meant stop. Holding a lantern still at arms' length meant slow down. Raising the lantern straight up and down meant go. The caboose is the car that comes at the end of the train. Caboose comes from the Dutch word kabuis, which means a cabin on a ship's deck. In the early days, the caboose served as an office for the train's conductor and brakemen. It usually contained a desk, bed, stove, heater, and other supplies the conductor might need. Print this page to write about trains. Write a story, poem, or report.